We have taken our three favorite tours and combined them into our best tour yet! Join us for Austin's best barbecue and beer along with a tour of downtown's greatest spots. What more could you ask for? Jump in our fun open-aired electric cart for this awesome adventure of brew, bbq and fun! Come along with us as we enjoy some of the best food and drinks Austin has to offer on this all inclusive, local insiders-perspective, Brew and Q tour! Staying downtown? Start off with your driver picking you up in an open aired, 100% electric shuttle right in front of your Hotel or Short Term Rental. Staying outside of Downtown? No Problem! We will just meet you at the Austin Visitors Center located at 602 E. 4th Street. Texas is known for its BBQ and that is where this tour begins! We start off at Terry Blacks with a meet and greet with the pit master himself. 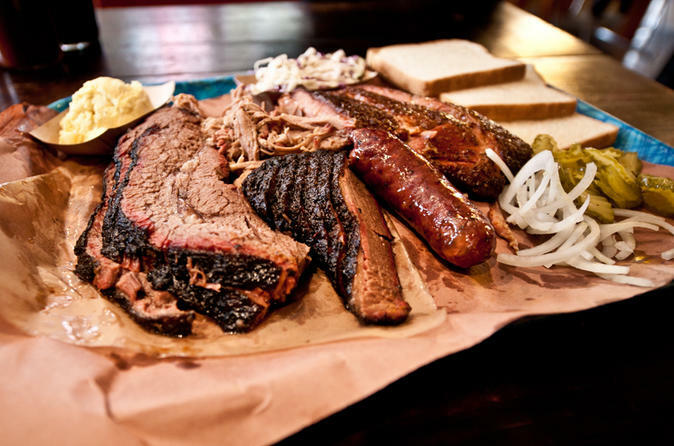 Hope you are hungry because we will sample over a pound of the most mouthwatering BBQ Austin has to offer. Sausage, Ribs and Brisket are all on the menu, along with delicious sides and an ice cold beer or soda! We then take a quick trip to the Greetings From Austin mural for a picture perfect photo op before continuing the rest of the downtown tour. It is now time for the brew portion of our tour as we head to our favorite local brewery, Lazarus on the east side. Sample a flight of their best beer before loading up and heading back to your original pick up location. Are you ready for three hours of fun, food and beer?!?!? !